It is usual when someone is robbing a bank that they concentrate on what they are doing. Not 19-year-old, Northern Virginia Community College student Candice Rose Martinez. 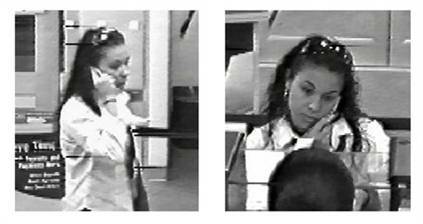 When she took to stealing, she spoke continuously on her mobile while committing the robberies of four Wachovia Bank branches in Northern Virginia. It transpired that she was talking on the phone to her 19-year-old boyfriend, Dave Chatram Williams, who was also the getaway driver. The first robbery happened on 12 October 2005 and the last on 4 November 2005. In the first three heists Martinez walked into the bank chatting on her mobile and, when she got to the counter, gave a box to the cashiers. In the fourth robbery, she did not carry a box but showed a .38 calibre revolver and handed the cashier a note. On 22 October she gave the cashier an empty box with a typed note taped inside. It read, “You have 40 seconds to put all your money in the box, do not make any sudden moves.” Martinez then told the cashier to put $100 and $50 notes in the box, saying, “I need you to empty all the drawers — you have three. You’re taking too long, you have 40 seconds.” Williams and Martinez were arrested on 14 and 15 November 2005, respectively. When police searched Martinez’s Chantilly, Virginia, apartment, they found $3,500 in cash, a mobile phone box, a high school yearbook, a computer, some Louis Vuitton bags and a digital camera. The four robberies resulted in a haul of $48,620, which the couple spent on a 1997 Acura Integra, two big screen televisions and designer clothes and bags. On 13 December 2005 Martinez pleaded guilty in US District Court in Alexandria, Virginia, to two felony charges. On 3 March 2006 she was sentenced to 12 years in the Federal Bureau of Prisons, to be followed by five years on probation. District Judge Gerald Bruce Lee also fined Martinez $200 and ordered her to pay $43,850 in restitution. Williams, a former Wachovia employee, had also pleaded guilty and, a week earlier, was sentenced to 12 years in prison.